(CNN) -- More than a week after the swine flu outbreak rattled the world, with cases of infected people popping up from Mexico to South Korea, the new virus strain has shown up in a herd of swine. 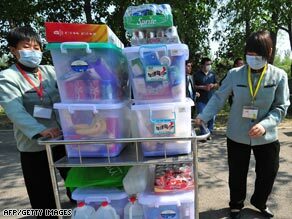 Masked workers push food to a sealed-off hotel in Beijing where Mexican nationals are being quarantined. The catch, Canadian officials say, is that the animals may have caught the flu from a human. Canadian officials are quarantining pigs that tested positive for the virus -- scientifically known as 2009 H1N1 -- at an Alberta farm in what could be the first identified case of pigs infected during the recent outbreak. They said the pigs may have been infected by a Canadian farmer who recently returned from a trip to Mexico, the epicenter of the outbreak that has sickened more than 680 people. The farmer "may have exposed swine on the farm to an influenza virus," said Dr. Brian Evans of the Canadian Food Inspection Agency. Evans and other officials said it is not uncommon for flu viruses to jump from humans to animals and that it does not pose a risk for consuming pork. The number of pigs infected was not disclosed. The infected farmer had flu-like symptoms and is recovering, Evans said. Dr. Michael J. Ryan, the WHO director of its global alert and response team, said the doses of the drug Tamiflu came from a stockpile that was donated by Swiss health-care giant Roche in 2005 and 2006. Roche said it was working with the WHO to prepare for the virus. The drug should be taken within 48 hours of experiencing symptoms, according to the drug's Web site. Mexico has the most confirmed swine flu cases, with 506 infected people and 16 deaths, the WHO said. Mexican Health Minister Jose Angel Cordova Villalobos reported that the country has confirmed 421 cases and 19 deaths. Several other countries, including Canada and Italy, had confirmed additional cases that had not yet been added to the WHO's total. The United States has the second-highest number of confirmed cases, with 160 sickened and one death, according to the Centers for Disease Control and Prevention and the WHO. President Barack Obama spoke with Mexican President Felipe Calderon on Saturday afternoon to discuss both countries' "efforts to limit the spread of the 2009 H1N1 flu strain and the importance of close U.S.-Mexican cooperation," the White House said in a statement. Ryan said the WHO was still preparing for a pandemic. "At this point we have to expect that phase six will be reached," he said, referring to the organization's highest pandemic threat level. "We have to hope that it is not reached." And he noted that a pandemic describes "the geographic spread of the disease, not its severity." The latest developments come as parts of Asia discovered they were not immune to the spread of the virus. Hundreds of guests and staff were under quarantine in China after health officials determined that a hotel guest had contracted the H1N1 virus. Nearly 200 hotel guests and 100 staff members were ordered to stay in Metro Park Hotel in Hong Kong for seven days to stop the spread of the H1N1 virus, a government spokesman said. The quarantine was ordered after a 25-year-old Mexican man stayed in the hotel and became sick, according to the spokesman. It is the first confirmed case of the virus in Hong Kong, local medical officials said. South Korean officials on Saturday confirmed their first case -- a 51-year-old nun who recently traveled to Mexico for volunteer work.